Hulkenberg made his karting debut aged 10 and enjoyed success before moving up to German Formula BMW in 2005. He dominated the championship and comfortably won the title, following in the footsteps of Nico Rosberg and Sebastian Vettel. In 2006 he joined the German A1 Grand Prix team and almost single-handedly won Germany the title with nine victories in his debut season. After a year in German Formula 3, he moved across to the Formula 3 Euroseries and finished third behind Romain Grosjean and Sebastien Buemi before taking the title the following year. In December 2007 Hulkenberg tested for Williams, outpacing race driver Kazuki Nakajima and clocking a time only 0.4 seconds slower than Rosberg. His performance impressed Williams enough to offer him a test driver seat for the 2008 season. Juggling his commitments to Williams, Hulkenberg moved on to the GP2 Asia series over the winter, taking pole in his first race and finishing sixth in the championship despite only competing in four races. The following season he progressed to the summer GP2 series where he wrapped up the championship at the penultimate round at Monza -- the first time the series had been won before the final round. In November 2009 Williams announced Hulkenberg would partner veteran driver Rubens Barrichello for 2010. A solid rookie season followed, topped off by a brilliant performance over one lap at Interlagos in damp conditions to secure pole position at the Brazilian Grand Prix. However, in 2011 money spoke louder than talent and he was given the boot for the latest GP2 champion Pastor Maldonado, who was backed by sponsorship from Venezuelan oil company PDVSA. He found a new home at Force India as a third driver and after a series of Friday morning practice outings, did enough to be promoted to a race seat in 2012. After a slightly slow start to the season, Hulkenberg started to get the better of teammate Paul di Resta and was linked with a move to Ferrari before settling for a switch to Sauber on a one-year deal. However, Sauber didn't enjoy the same success as it had in previous seasons, and despite a number of impressive drives Hulkenberg's best result was a fourth place in Korea. Although the podium still eluded him, his displays saw him linked with Ferrari once more and Lotus before the former re-signed Kimi Raikkonen and the latter chased Pastor Maldonado's cash, leaving Hulkenberg to return to Force India for 2014. His lack of funding turned out to be a blessing, however, with Lotus enduring a rotten season while Force India flourished with Mercedes engines -- especially in the first half of the year. Hulkenberg recorded ten consecutive points-scoring finishes and, though his form tailed off slightly as Force India's development slowed down, the German was one of the standout drivers of the season. Although he was beaten by teammate Sergio Perez in 2015, he achieved the highlight of his career with victory at the 24 Hours of Le Mans with Porsche. But rather than pursue a career in endurance racing, Hulkenberg remained committed to F1 and signed again for Force India in 2016. It was another solid year but by the end of it Hulkenberg was looking for a change. A chance at the top teams appeared to have passed him by, but with Renault investing heavily in its new works team, Hulkenberg joined Jolyon Palmer at the French manufacturer for 2017. Over the course of the 2017 season he dominated Palmer, who was replaced by Carlos Sainz for the final four races. 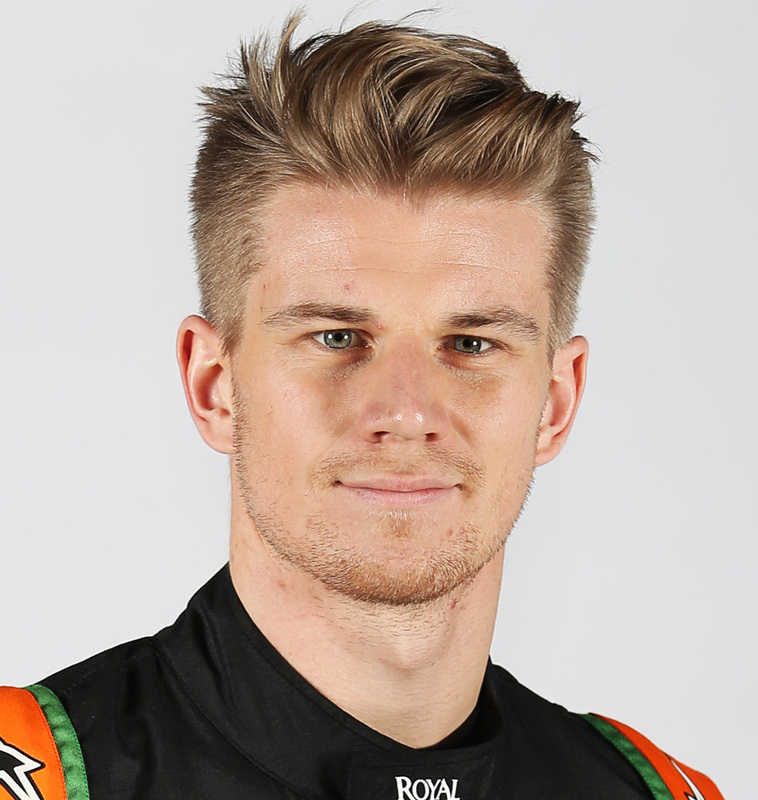 Undoubtedly talented, Hulkenberg was earmarked as a star of the future. His second full season was impressive and almost earned him a Ferrari drive, but his height and weight consigned him to another season in the midfield as the new regulations come in to effect in 2014. Winning the 24 Hours of Le Mans with Porsche in 2015 after fitting the grueling endurance race into his F1 schedule. After a phenomenal debut season in German Formula BMW in 2005, Hulkenberg went on to win the world final, only to be stripped of the trophy after being accused of brake-testing one of his rivals during a safety car period. "The drivers who have won GP2 in their first year - Nico Rosberg, Lewis Hamilton - are all pretty outstanding, and I think Nico will be outstanding as well." Patrick Head, Williams director of engineering. "I can say that the boy has an unbelievable talent. So much about him already reminds me of Michael Schumacher." Willi Weber, Hulkenberg's manager. "I won't be the next Michael Schumacher or whatever. When I get to Formula One, and I believe I have still a long way to go, if I do get there, I want to be the first Nico Hulkenberg." Manager Willi Weber nicknamed Hulkenberg 'The Hulk', referring to his change in personality when he gets behind a wheel.